I was reading this blog post on The Last Krystallos about Lisa's latest project (Of Mist and Magic – Really Slow Motion), and had to comment. When I got a reply and read the last sentence, I knew I had to post it out here to remind myself that I do have some skill at writing, even though I'm still a beginner. I've read some of Lisa's work, and she is a good writer. She has even published real books—something I hope to do eventually! 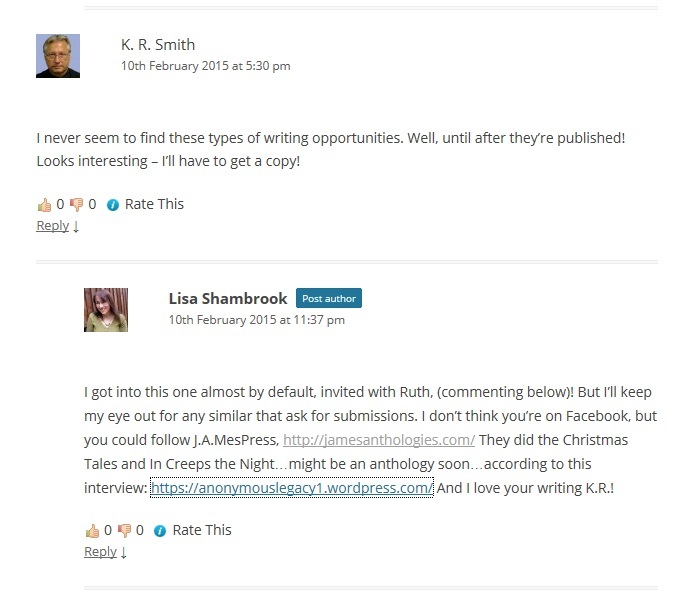 When an author you respect says they love your writing, it really does mean a lot! You do have real talent for writing. You combine imagination and craft so that reading your work is always a pleasure, even when it's in a genre I tend to pass over. A publishing contract is just around the corner, I know it! Thank you, again! I wish I felt as skilled as you describe. I'd just be happy if my next short story was accepted! It's highly unlikely, but I'll keep a watch for it! Still, I know I have to do more than short stories and poems, but finding the time - that's the problem. So the anthologies let me get something out there. I always like the requests for submissions that say, "Send us your best, a story with a different outlook, a fresh voice, etc., etc. - Exposure only."